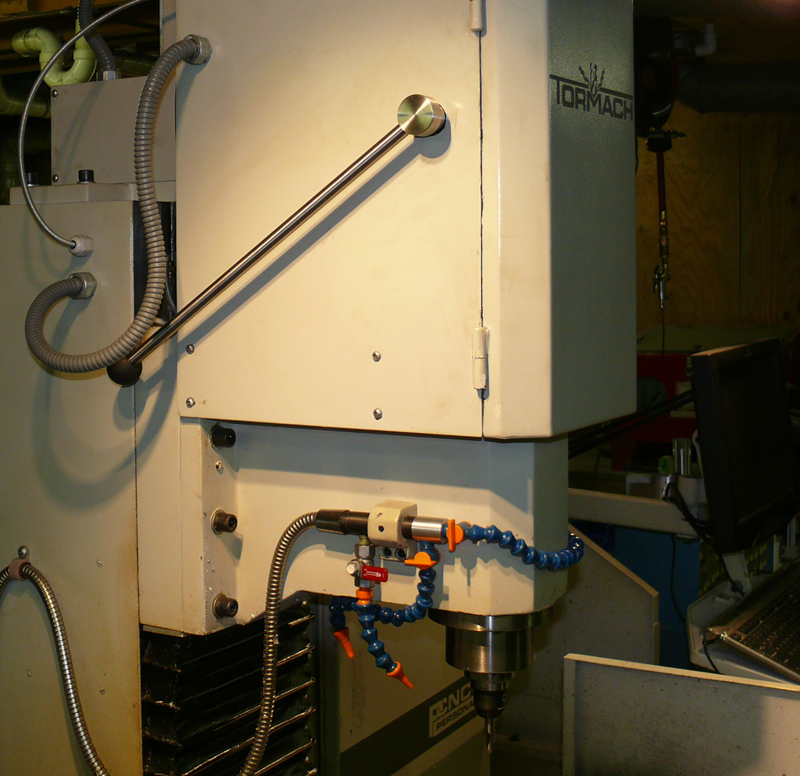 In the hobby and entry-level CNC machine world, Tormach’s mills are ubiquitous. They may not be the highest performance machines out there–but they are a tremendous value and so they’re like the Chevy Small Blocks in the engine world. It’s not the same as a Ferrari V12, but you can keep one running cheap and build it up to be amazingly powerful. And like the Chevy Small Blocks, there are hot rodding options galore for the Tormachs. This article is a compendium of the hacks, modifications, and upgrades I’ve been able to find out on the Internet for Tormach’s machines. They include both DIY articles by various Tormach owners as well as commercial products from a variety of sources you can purchase to upgrade your Tormach. If you own a Tormach machine yourself, this list may be helpful if you choose to improve one of these already very good machines. 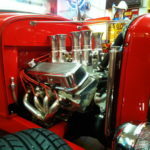 For those who are loath to modify a machine, I can only suggest that Hot Rodding is not for everyone, and any change you make is made at your own risk. Some modifications are probably even dangerous to the operator and the machine. Yet, I think it’s a shame not to take a shot at some minor modifications at least, for we are machinists, and machinists are the masters of their machines. If anyone should be modifying them, it surely must be us. Yes, by all means, wait until you’ve run your warranty out. Perhaps start with some of the many fine modifications and updates Tormach sells which will not void your warranty. Add a tool changer or a powered drawbar. Upgrade the coolant system in some way. But when you’re done with all that, explore the possibilities that are available. If you come across a good item for this series that I’ve missed, drop me a note via email (bob@cnccookbook.com), and I’ll see about adding to this list. I want to keep the list to Tormach-specific items, so even though there’s a lot of cool tooling and accessories for CNC’s out there, this article is only about items specifically designed for the Tormachs. Tormach themselves are constantly improving the machines. My PCNC 1100 is a “Series Three”. So far, Tormach has a great track record of making it fairly economical to keep older machines upgraded to the latest factory spec. That shows a tremendous commitment to the installed base and it’s not something every company will do. 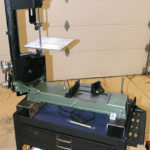 In addition, there is a tremendous line of factory bolt-on accessories such as the powered drawbar, 4th Axis, and Automatic Tool Changer I’ve pictured above. I’m not going to spend time documenting all the Tormach Factory Upgrades that are available, but I do recommend that if you’re looking to improve your Tormach, you start by seeing whether Tormach themselves have an upgrade for the area you’re interested in. If they do, you can be sure it is well made and well engineered. Just check the Tormach web site for details of what’s available in the way of upgrades. These companies design and sell upgrades and accessories for Tormachs. 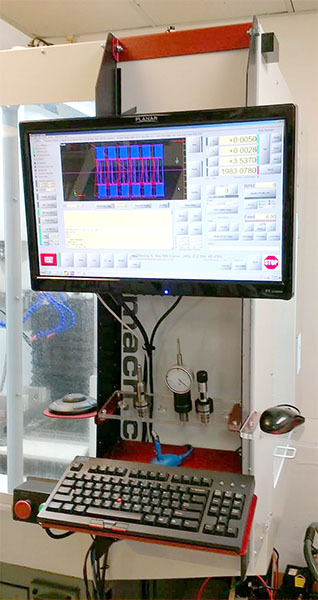 John Bower’s Santa Cruz Electronics is the local stocking dealer for Tormach. He’s practically right down the street from CNCCookbook so John and I get together pretty often. Being an avid tinkerer and machinist, John makes a fair number of interesting gizmos for Tormachs. For example, he makes the nice anodized ER Collet wrenches that Tormach sells on their site. 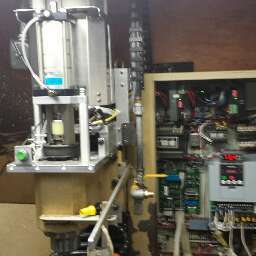 Lately he is readying a batch of very cool upgrades and he has promised I will get to test the prototypes. There’s more news coming soon on this, but I couldn’t resist teasing you a bit up front. I love John’s TTS Racking systems. I brought some crude drawings of an early concept for this to lunch and John took the idea and built an absolutely gorgeous product. It totally organizes all your TTS holders right on the machine and makes them super convenient to access and use. He also has a bench top version, as well as a line of accessories to go with The Rack. We did a full review of the racking system on the CNCCookbook blog. SCE’s Enclosure-mounted TTS Holder rack is awesome! Installation is very sanitary and compatible with the stock system. Looks sharp and works great! Stay tuned for more details on The Rack, coolant upgrade, and other SCE Tormach accessories coming soon! Dan Bye’s Tosa Tool makes some great enhancements for Tormach. My favorite is his line of Modular Fixturing and Tooling Plates. 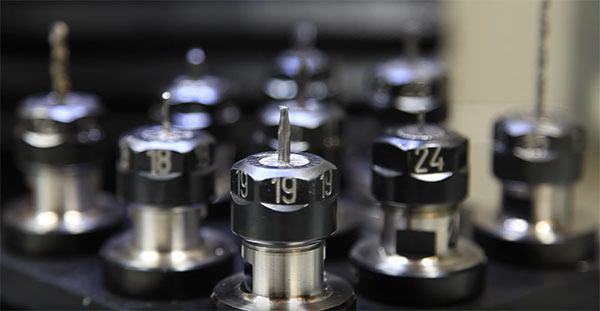 Having a Tooling Plate can make set up much faster and easier as you can just drop fixtures onto the plate and be assured they will register accurately to the same position as when you last used them with very tight tolerances. 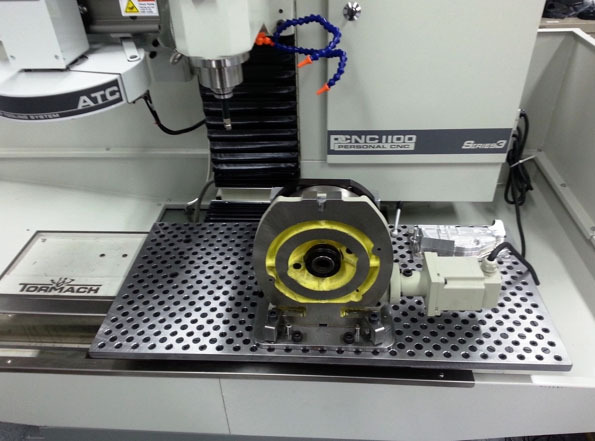 For more on Modular Fixturing, see our Total Guide to CNC Milling Machine Workholding. Mandala’s kit helps you get your 4th axis over to the right side of the table where it can’t interfere with tool changer operation. Fancy a Joystick instead of Tormach’s default Jog Shuttle? Millfast has got you covered! 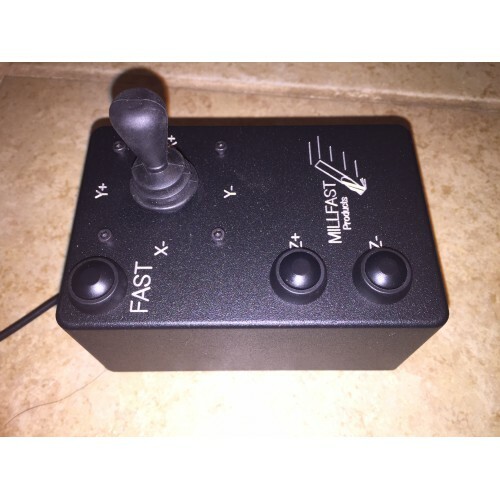 They have a variety of cool accessories including, joysticks, remote e-stops, and more. I purchased the little gizmo that lets you keep both a probe and an electronic toolsetter connected at the same time. Works great! This label was done with a Dymo XTL 300 Industrial Label Maker Kit. The labels are supposed to be pretty darned coolant-proof. You can get one for less than $300 from Amazon. The one that I did, with Joe’s help, was to drill and tap a larger hole in the part of the ATC that attaches to the stepper motor. The allen head screws in there are too small for the rotation of the ATC loaded with tools. Joe drilled and tapped it larger for me (it was hardened) and we put a bigger setscrew in there. The other that Joe did but I did not do was put a larger magnet for the sensor to do location. 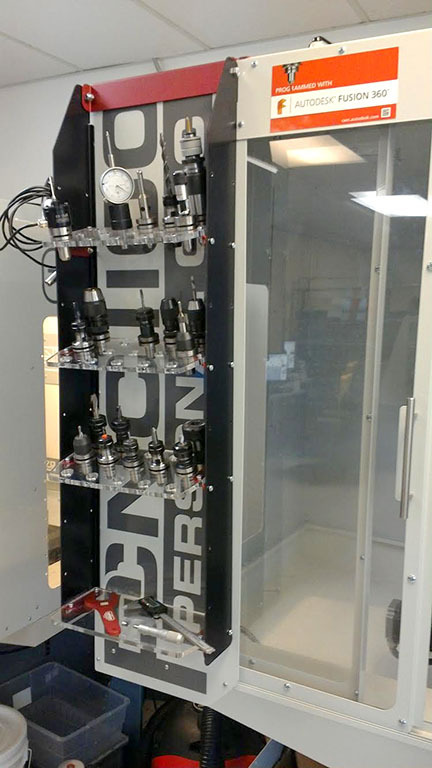 High price of a factory toolchanger got you down? It’s easy to build as most of the motion is just programmed using g-code macros. This design holds 4 tools, but depending on your machine and fixtures, you could have more than one row for more tools. 3 rows would get you 12 tools, which is pretty darned good. Possible further mods might be a lid to keep the chips off that swings out of the way when the spindle gets near. I could see a chip umbrealla that’s totally lever operated with a lever that the spindle pushes as it moves into position. The more ambitious could build a circular carousel just like the factory changer to hold more tools. Mount it the same way instead of using a retractable arm and build the stepper that rotates the carousel so it could be plugged into the Tormach’s 4th Axis port. Now you’ve got a lot more tools available and a very cheap toolchanger. Need to use your 4th axis? Unmount the carousel and drop a wine-rack type in its place. Saw this one on the Tormach Facebook Group and it was done by Jason Hughes and Clifford Baeseman. Very well done. 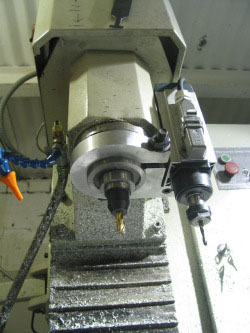 I especially like the diagonal approach of the ATC to the spindle, which is similar to many industrical VMC designs. It gets the ATC as far out of being in the way as possible when not doing a tool change. 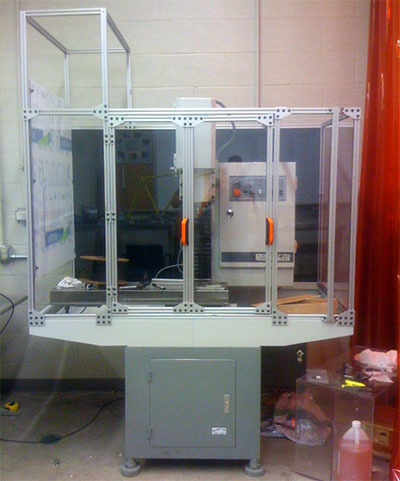 – University of Iowa’s Grok Labs Enclosure. The little box at top left provides clearance for a robotic arm (STRobotics) they’ll be interfacing to the Tormach. The enclosure uses 80/20 extrusions and the article says the raw materials cost about $1800. – G-Made lights up a Tormach lathe enclosure. 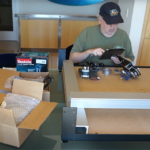 – Jason Hughes’s video shows the professional looking enclosure he put together along with a bunch of other great tips for 440 owners. 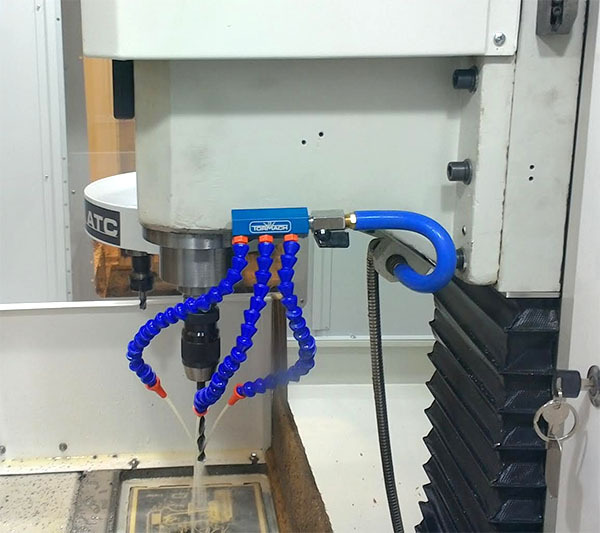 Coolant can be the lifeblood of your CNC system (along with way oil), and upgrading the Tormach coolant system is especially helpful if you’re trying to use the machine for production and the chips keep piling up. These mods are also known to improve surface finish (see John Grimsmo’s filter video where he shows finish issues on his knives that a filter cleared up) and tool life. A variety of upgrades are possible. 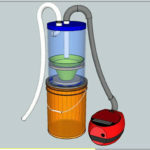 The stock coolant reservoir can run dry pretty easily, so increasing reservoir capacity is common. Putting in a bigger coolant pump, adding more and better nozzles, check valves, washdown systems, and a variety of other possibilities are available. – John Grimsmo filters his coolant. This is an excellent upgrade because it removes fine chips that are otherwise circulating in the coolant and can clog lines (especially nozzle tips) and even damage parts as John shows in the video. Adding a filter is super easy and ought to be one of the first coolant upgrades you try. – Grimsmo Pump and Reservoir Upgrade. – War Machine LLC adds a coolant filter and some other upgrades. Nice section of the video where he actually traps particles coming out of the coolant nozzle. Really makes the point of how much trash is suspended in the coolant flow without a filter. 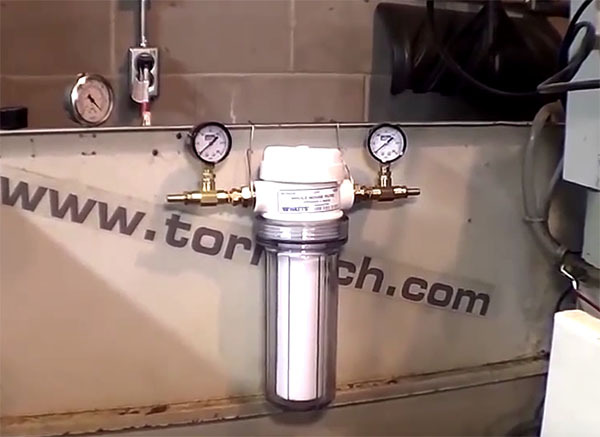 – G-Made CNC upgrades his coolant system with a filter, bigger reservoir, and more. His chip tray on the bigger coolant reservoir has some clever ideas. 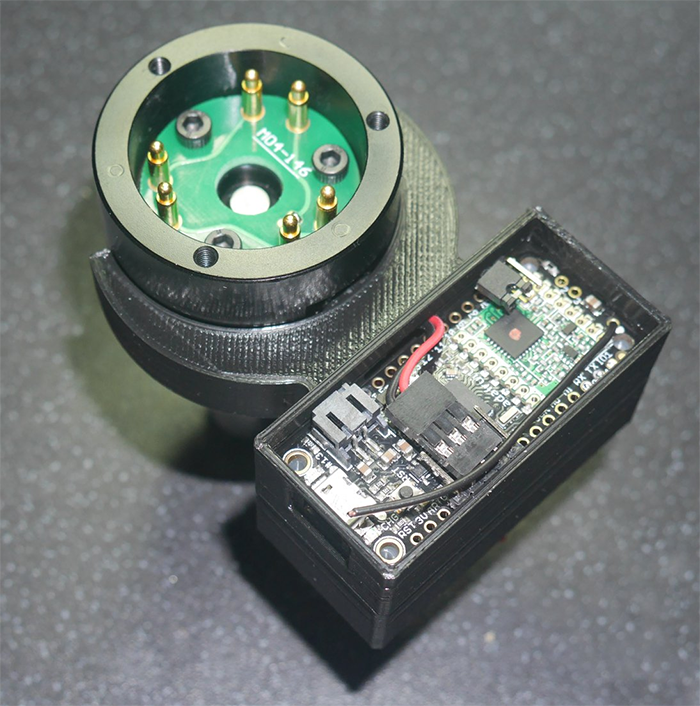 – Nice multi-nozzle upgrade on CNCZone. – Chris Anglin’s Thread on Upgrading his coolant system. Chris did a bunch of work, adding a multi-nozzle setup, 1/2″ hose upgrade (larger diameter), bigger pump, larger reservoir with high flow drain mod, and more. 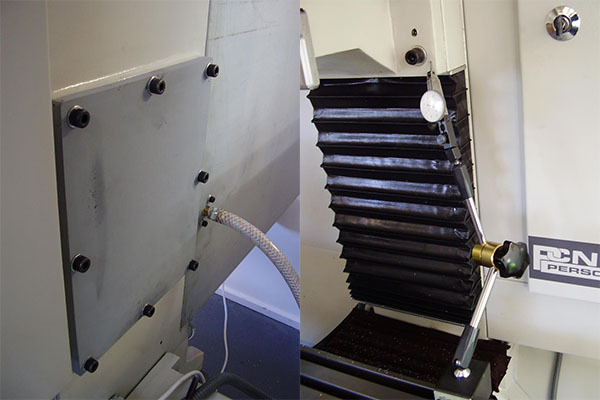 – Brian Carmichael’s Coolant System Upgrades: Multiple coolant nozzles, 5/8″ ID lines, a solenoid operated air-only system, and I particularly like his washdown system for cleaning up the machine after a big job. 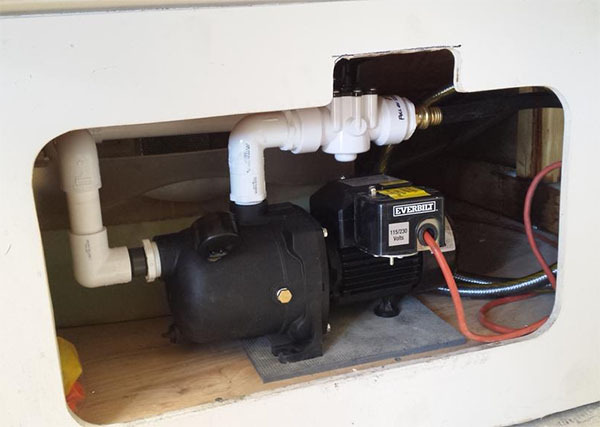 – Bigger Pump and More Coolant Upgrade: From that fellow that did the 5 HP upgrade (see below). 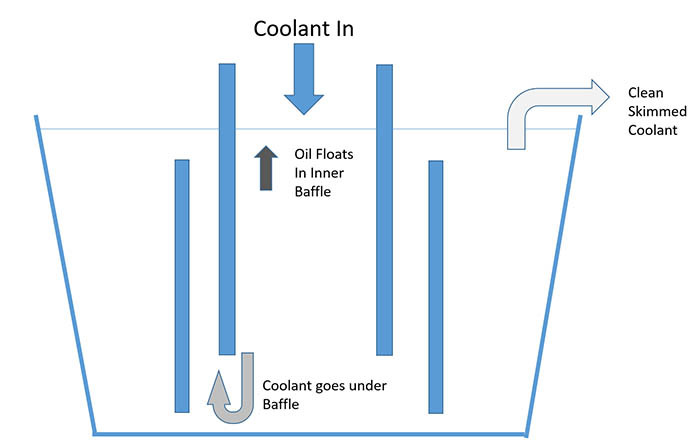 – Coolant Slinger: Planning a coolant system upgrade? 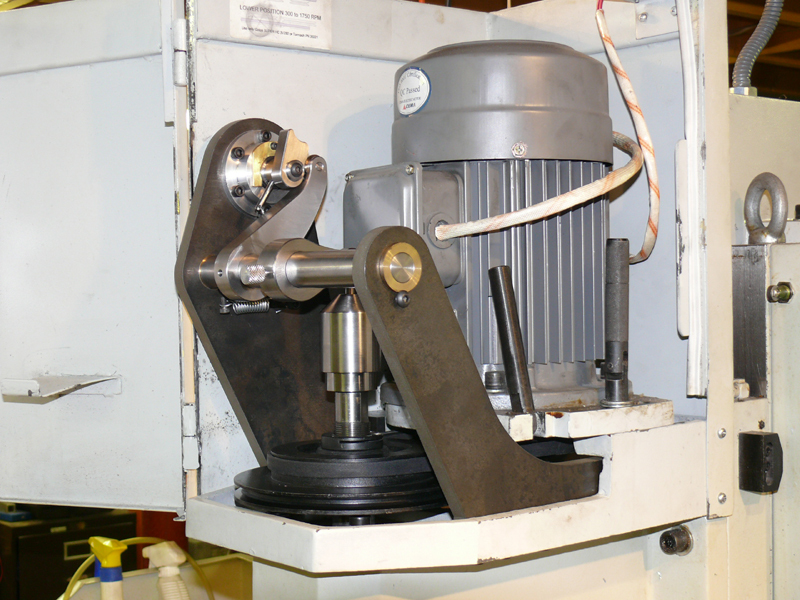 You might want to keep that extra coolant out of your spindle bearings by adding a slinger. This one was a press-on UHMW piece. – Tramp Oil Skimmer: Coolant picks up way oil quickly, and if you don’t get the oil skimmed from your coolant it’ll soon be a stinky mess. This Tramp Oil Skimmer does the job cheap and cheerfully. 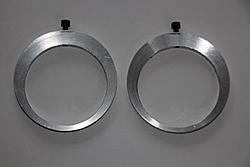 – Coolant Rings & Collars: Some say these are absolutely the best nozzle arrangement for clearing chips consistently. 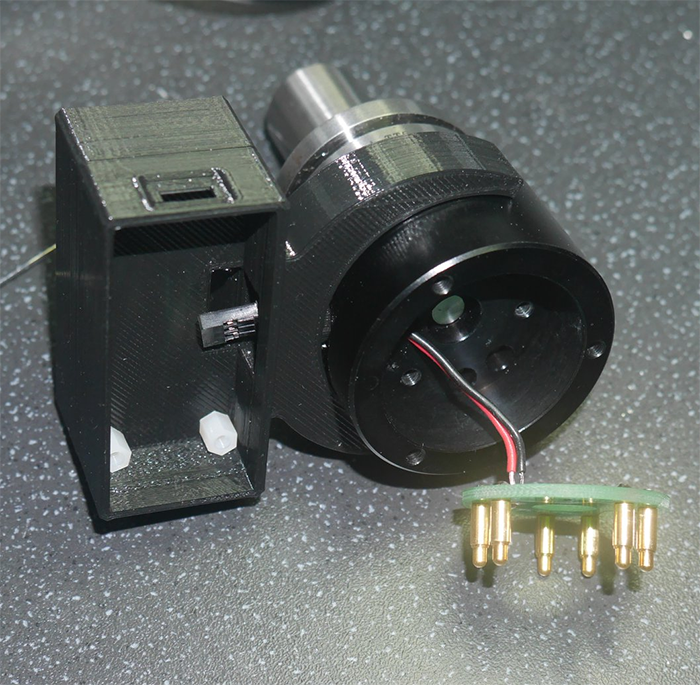 A number of folks have reported improved surface finish as well as quieter operation by either balancing the motor fan or removing it and using an electrical fan. Your motor does need a fan of some sort to stay cool, so if you undertake one of these modifications, make sure your motor doesn’t overheat! 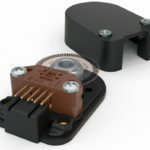 – Motor Fan Balancing: Nice article on balancing the fan to improve surface finishes. – Electric Fan Mod: Video has a bunch of mods, electric fan is at 8:34. Quieter and pushses a lot more air. Also helps cool the spindle. – Control an Electric Fan from the VFD. This pages discusses how. 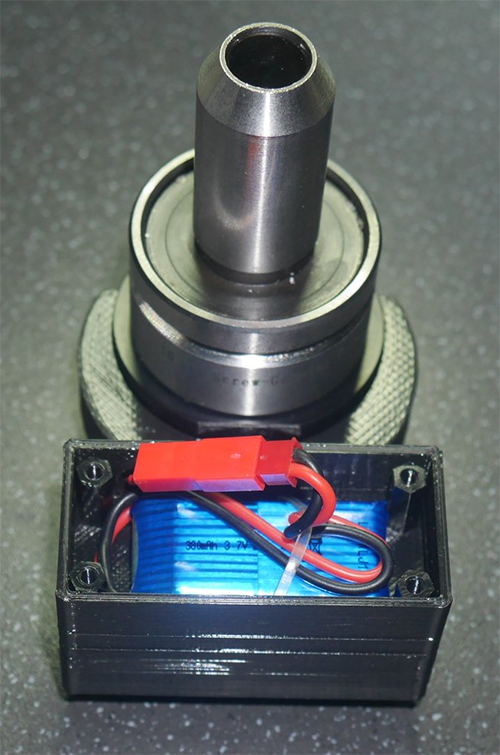 – Rebalancing the Spindle Pulleys: Here’s a fascinating thread about rebalancing the Tormach spindle pulleys to improve surface finish. One of the neatest solutions was the eccentric rings pictured to make balancing a little easier. Rigid Tapping on a Tormach? Heck yeah! 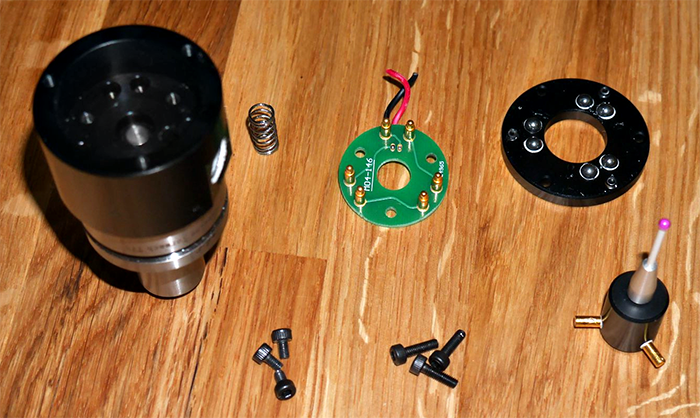 You’ll need to mount an encoder to the spindle, and you’ll need to be running PathPilot, but it’s totally doable as this CNCZone thread demonstrates. – A sneaky way to run your spindle at 2x rpms: Try this sort of thing at your own risk as you may fry the spindle bearings going too fast. 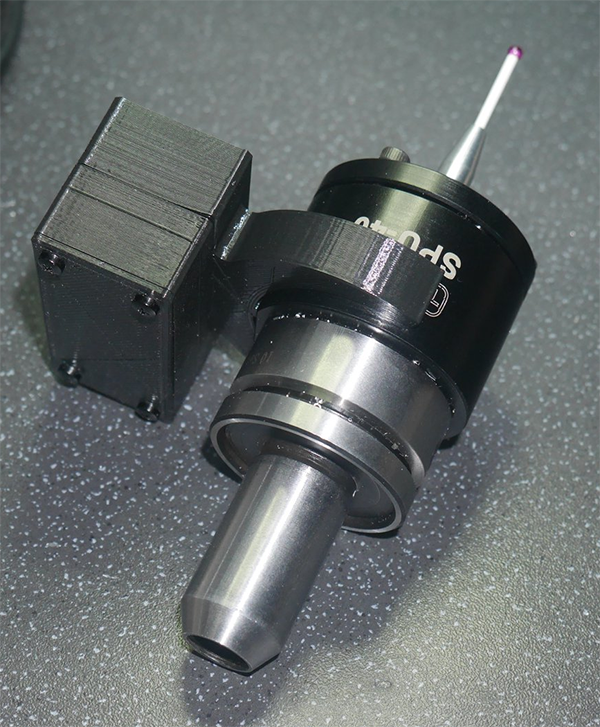 Small cutters and engraving especially can really benefit from much higher spindle speeds than the Tormachs allow. A time-honored way to solve this problem is to mount an auxilliary high speed spindle alongside the machine’s main spindle. Here are articles about how to do that. Kontraptionist High Speed Spindle: Mounting a 24,000 rpm spindle to the Tormach. 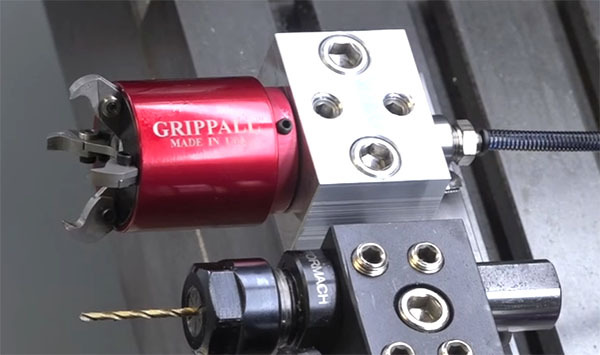 – Video of some gorgeous engraving also shows his aux high speed spindle on his Tormach. Vid is kind of long. 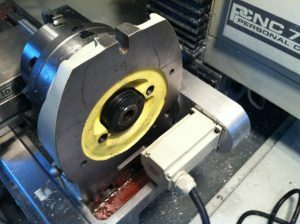 – Adding a 5 HP motor to a Tormach PCNC 1100. Great thread! It’s a long read with a lot of naysayers but the conversion looks quite successful in the end. 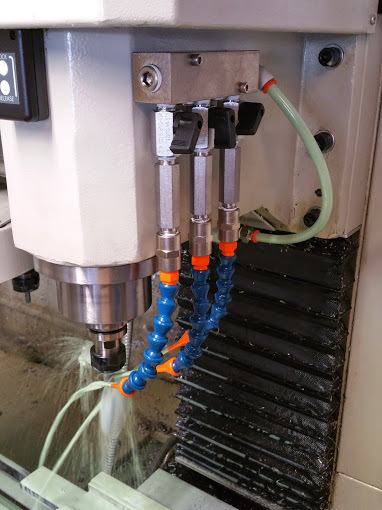 – G-Made CNC’s Pneumatic Collet Closer for the Tormach Lathe. 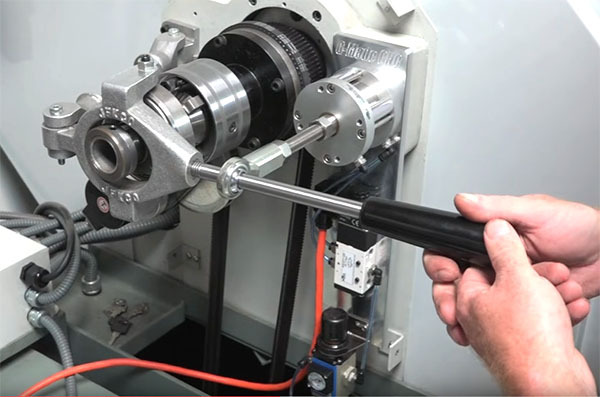 Add an air cylinder to the manual collet closer, grab a bar puller, and your Tormach lathe can automatically feed multiple parts from bar stock. The project is documented in multiple videos. I’ve linked the first above. 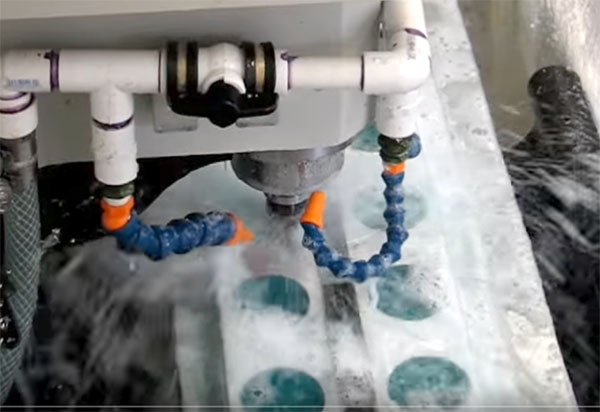 The others are: Machining the Bracket Plate, Part 3 – Assembly and Installation, Part – 4, and the final Finishing Up Installment. 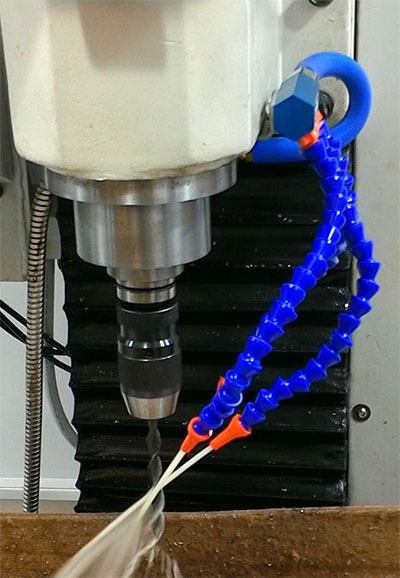 – G-Made Bar Puller to go with the pneumatic collet closer. This is a two-part series with the second part giving final details of how to control it all with g-code. This is a useful wiki describing how to get Path Pilot to work with non-Tormachs. How is that helpful to Tormach users? Well, let’s suppose you’ve decided you want to upgrade your Tormach’s rapids motion, perhaps by adding servo motors. You’re going to be faced with modifying Path Pilot to make all that work. This resource could be a big help to you in doing that. Here’s a tutorial with more similar information on the LinuxCNC forums. 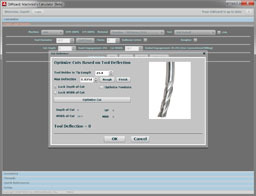 – John Grimsmo makes his own touch probe tips. Because those suckers break often and are expensive! 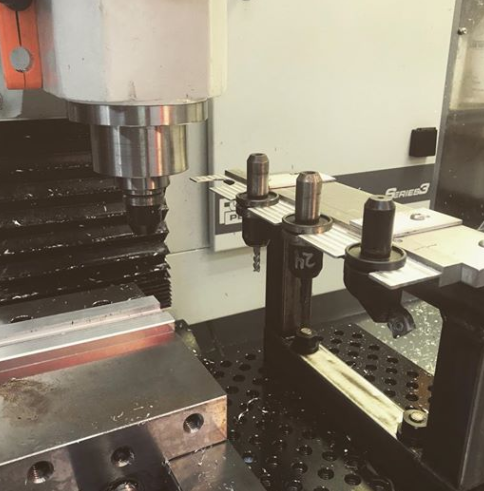 – G-Made mounts a GoPro camera on the Tormach Slant Bed lathe. – Machine Rigidity Upgrade: This mod suggests a measureable rigidity increase by bolting a thicker access plate to the Tormach column. – Interesting discussion of the increased accuracy of optical limit switches. In particular, the idea of using a slotted switch on the ballscrew is also interesting. This is a very cool mod by David Loomes on the Tormach Facebook group. No, I’m not concerned with latency. I’ve measured it at a fraction under 9.5ms and it’s consistent to sub microsecond levels. I generally do the 2nd probe at 25mm/min, so the positional error represented by the latency is just 0.00015″. Not only is that way below the repeatability of the probe, but it’s know and consistent. I expect it will result in a small reduction in the probe tip diameter as determined by any of the usual calibration methods and nothing else. 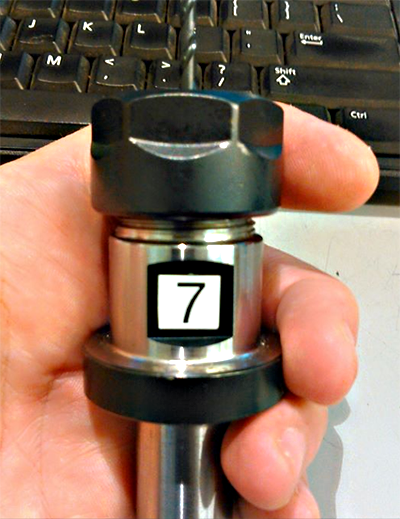 I calibrate my probe using a 0.75″ gauge ring and probe it at 10 deg intervals – then calculate the average apparent tip diameter. If the temp here rises a bit tomorrow, I’ll try that out and see what the difference is. It’ll also show up if the variation probe to probe gets bigger – it shouldn’t, but if it does, I’ll be stopping right there! RE battery life: Rx is powered from the mill (or a wall wart for a 440). If it loses contact with the probe, then it signals the probe is tripped to the mill. That prevents any probing functions from working and your program stops with an error message. If the Rx/mill are turned off, the probe goes into a sleep mode that extends the battery life to >1week – I got bored after 8 days as I wanted to do some probing! If the Rx/mill is turned on, then the probe has to be alert enough to spot the first fast probe with <1mm over travel. The probe also communicates regularly with the Rx to let it know it’s still alive and the battery voltage is good. In this state, battery life is ~27 hours. After the fast probe, the probe remains in high alert to give the minimum possible response time for the 2nd, slower probe event for a programmable amount of time. I have this set for 3s. Battery recharge time is 3-4hours from a micro usb. Reliability of these modules seems great. Even on the lowest Tx power settings, I get >20m range with 2 brick walls in between. I’ll have a better idea of how good when I’ve got some programmatic tests running on the mill. He’s setting this probe up to work with Fusion 360’s canned probe cycles. Fusion treats probing like more canned cycles. If you look inside your post for a function named onCyclePoint(x, y, z), that’s the bit that handles output of all the canned cycles. To handle probing, you need to add handlers for 19 more canned cycles. Since PP – or any other controller – probably doesn’t have exact equivalents ready programmed, you then have to add something at the controller end to do the work when the code runs. I took what I considered was the easiest route. The post generates g-code to store all the parameters from Fusion 360 in g-code variables, then executes M200 P<function-code>, where <function-code> is an integer representing the particular probing function. Adding an M200 handler to either PP or Mach 3 isn’t very hard. The game changer is persuading it to update a WCS other than the one currently active so that in the other WCS the point you’ve just probed ends up having the coordinates Fusion thinks it should have. Not just setting it to 0,0. The probing routines are also expected to check for and abort if they find unexpected contacts during the probing process. This isn’t a small job. My M200 handler currently does 11 of the 19 cases and it’s already past the 1200 line mark, so it’s not a job you want to take on unless you’re used to that sort of thing. 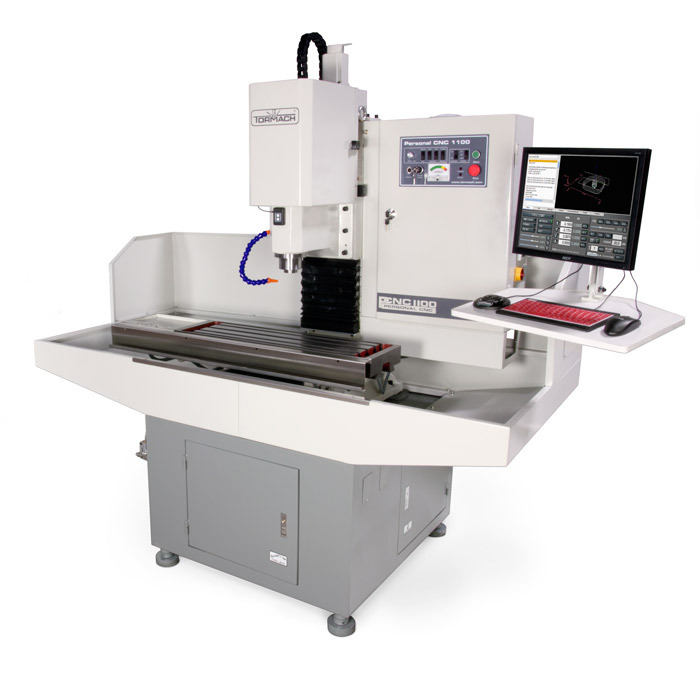 Tormachs are great general-purpose CNC machines, but they’re also great platforms for creating highly automated processes. I’m gathering good examples here. People say you just can’t use Tormachs for large runs of parts, but they’re overlooking the possibility of automating a Tormach way beyond what could be done with a VMC. They’re cheap, reliable, and easy to work on and modify, so why not? 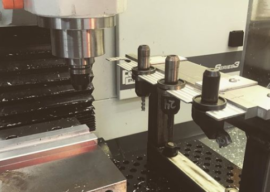 Rough Cutting: The Limiting Factor in Your Shop?